Square Enix are stepping up their advertising . 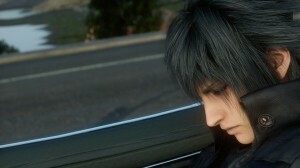 Final Fantasy has been on a lot of minds recently, especially following the ever more worrying moves that are being made regarding the demo for Final Fantasy XV. But despite all the eyes on FFXV, there’s still a great deal of excitement surrounding Final Fantasy Type-0 HD. So much so that Square Enix have release a brand new trailer today that gives a broad overview of the upcoming game in their very first European Active Time Report which was broadcast live from the city of London. The Trailer, titled “A New Type of Final Fantasy”, comes packed with all the content that fans of the original game want to see, including the historic environments and war torn vistas that is the Kingdom of Orience. Don’t forget that if you do want to get your hands on the demo for Final Fantasy XV then you’re going to need to get your hands on a copy of Final Fantasy Type-0 HD. It may be an expensive way to get a demo, but at least you’re still getting what looks to be like a phenomenal game.